With the weather getting colder and the snow approaching, it is not always easy to run to the grocery store and pick up the necessities. If you don’t feel like braving the weather or are so busy and can’t make it to the store, we’ve got you covered! 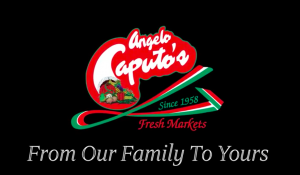 We offer online ordering and delivery with Shop Caputo’s! 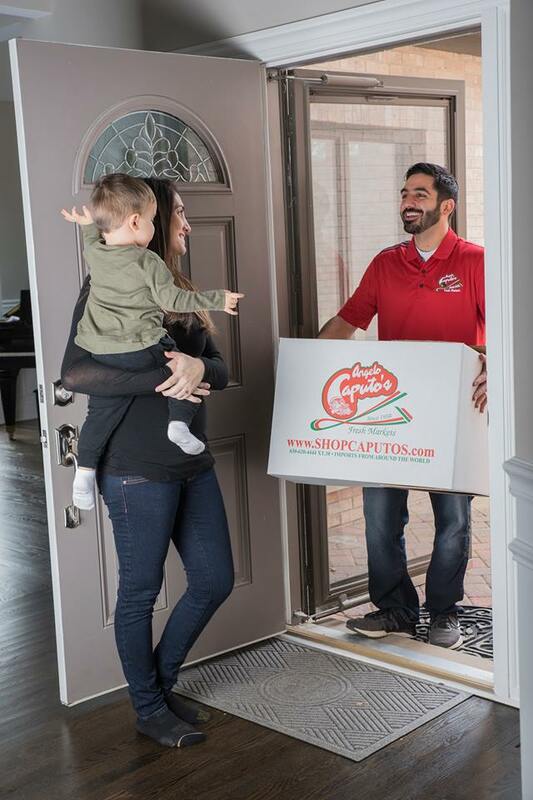 At Caputo’s, we always want to ensure the satisfaction of our customers and we go to great lengths to achieve it. When we started 60 years ago, produce was our focus. Though we’ve expanded, we take pride in offering a large variety of only the freshest produce. 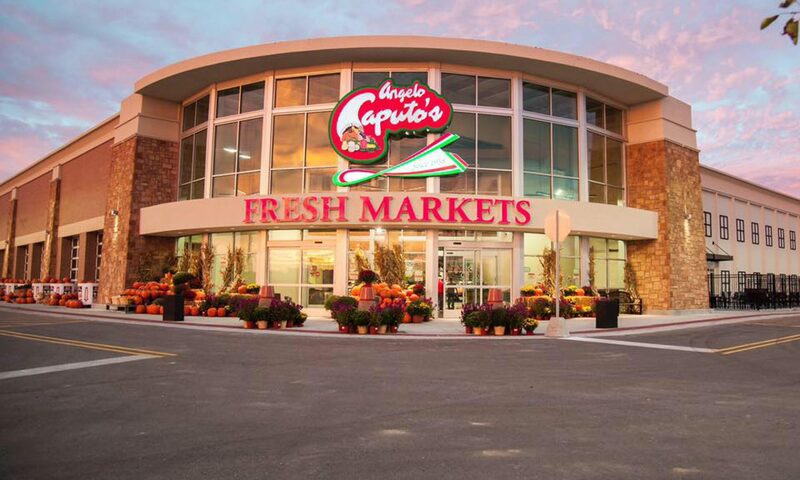 Our Shop Caputo’s pickers have been trained to select only the freshest and highest quality produce that fit customer preferences! 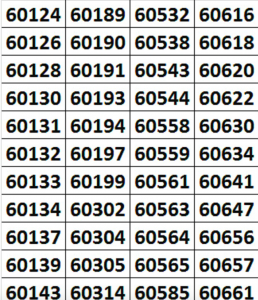 When you shop for produce online, you are able to add instructions or pick the color or ripeness of certain products! We pick the produce just like you would! We also ensure freshness. All perishable objects are picked the day your order will be delivered! Your deli and meat items will be sliced on the selected delivery day– no pre-packaged items, always fresh! You can customize the cut of your lunch meat and how you want it packaged. This is especially helpful on those Saturday mornings when there’s a wait at the deli counter! We offer all your favorite items. You can shop all our aisles and even shop our ad! All your favorite items that you shop for are brought right to your door–no lines, no waiting, with the same care you would use in shopping yourself! Our online shopping website is easy to use and very convenient. We are open Monday-Saturday and will deliver to you same day if you order before 2pm during the week and before 10am on Saturday. We also offer store pick up at any of our locations! Want free delivery! Use the code “grapevine” on your next order and receive free delivery! This code is only available for a limited time. Visit https://www.shopcaputos.com/store/Default.aspx or call 630-480-8205 to place your order! Thanksgiving is a holiday full of food– turkey, sweet potatoes, stuffing, and much more! But some might say that the most important part of every meal is at the end– the dessert! We have the perfect desserts that are sure to be a hit at your Thanksgiving dinners! 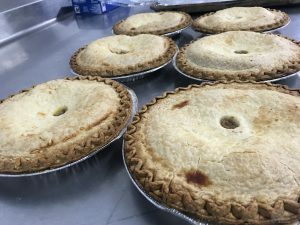 A classic dessert that is a staple in every Thanksgiving meal… PIE! Many people consider pumpkin pie the go-to Thanksgiving dessert. 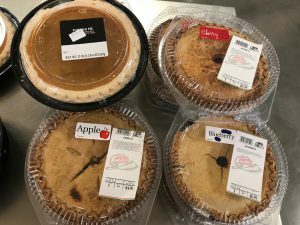 While pumpkin pie is delicious and always compliments a Thanksgiving meal, there are so many options for pies alone! 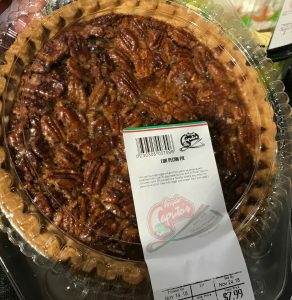 Peach, pecan, cherry, blueberry, and–Angelo Caputo’s favorite and an american classic– apple pie! So many options to satisfy any craving. 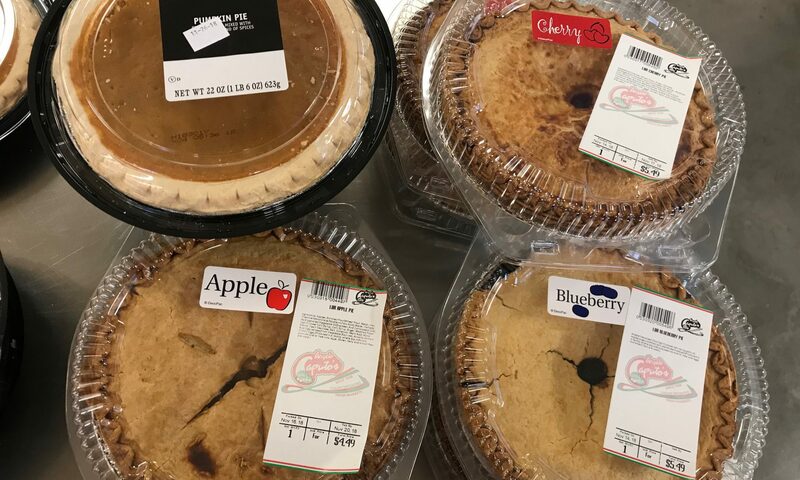 While you’re picking out the perfect pie, don’t forget the ice cream to go with it! Our bakery has cooked up some special treats specifically for the holiday! Butter cookies with holiday sprinkles, brownie platters decorated for thanksgiving, cookie cakes decorated for Thanksgiving or for the football game, and turkey cakes! 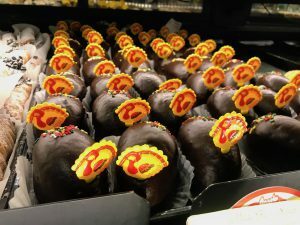 Turkey cakes are individual cakes covered in chocolate and decorated to look like turkeys. They are just as delicious as they are cute! Along with holiday desserts are the classic desserts. 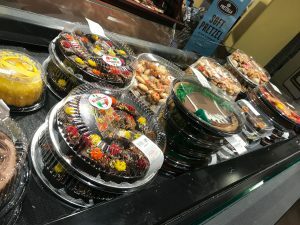 Our bakery has a wide variety of homemade desserts that are perfect for any occasion. Tiramisu, cannoli, pyramid cakes, eclairs and so much more! There are options for everyone to enjoy! In addition to those is our classic twist on cannoli! 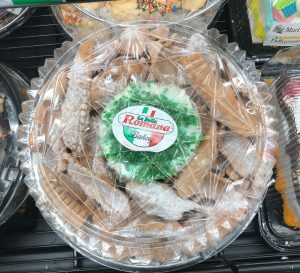 We offer a cannoli dipper which is a tray with cannoli chips and and cannoli filling in the middle of the tray–perfect for any party! As the holidays approach so does gift giving season. 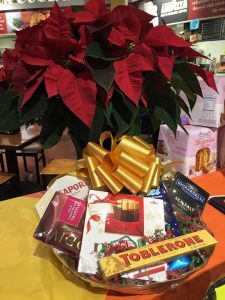 Whether you’re part of a gift exchange or you’re just bringing your host a gift, we can help you out! We have the perfect gifts that are simple but show you care! We have many go-to gifts that are easy and appreciated. One option is a bottle of wine. We have variety of wines that will satisfy any wino’s desire. Red or white, from Italy or from California— we have plenty options to choose from! Another staple for any party is a cookie or pastry tray. 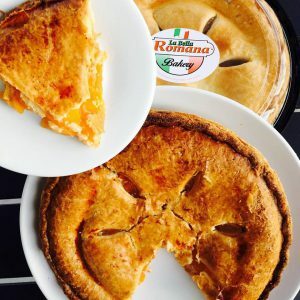 All of our cookies and pastries are made from scratch using recipes handed down, many coming from our Matriarch, Romana Caputo. They are easy to bring to a party and something everyone can enjoy. 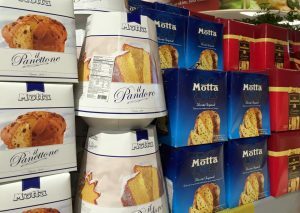 A classic gift amongst Italians around the holidays is a panettone. 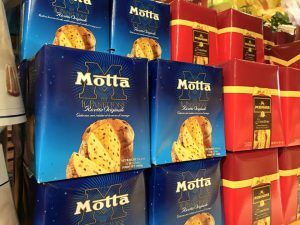 Panettone is a sweet bread that Italians enjoy around the holidays. It is a tall, dome-like shaped sweet bread that comes in multiple flavors. The baking process is long and involves curing the dough, then proofing the cake to give it the fluffy texture. There are then extras added into the dry mix like dried candies, raisins, or chocolate chips! 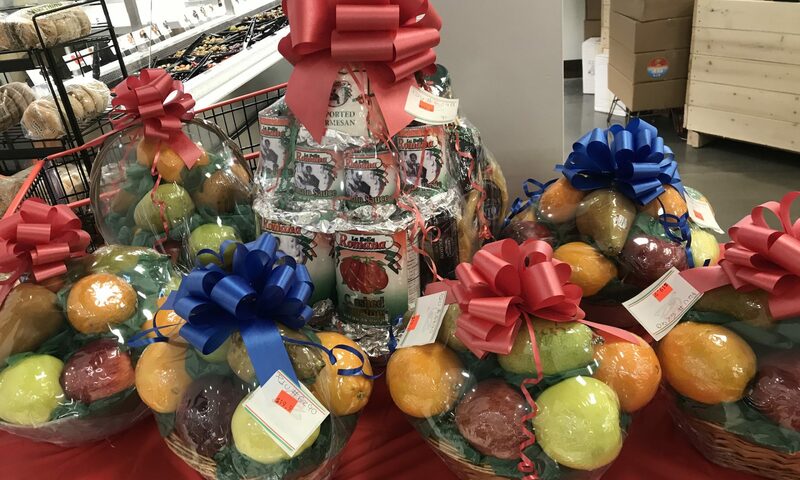 At Caputo’s we have a variety of gift baskets that are perfect for any occasion or gift! 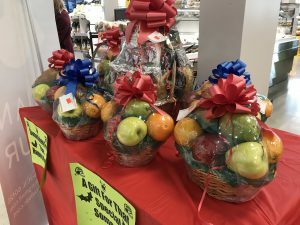 We have pre-made gift baskets. The pre-made baskets include the La Bella Basket, La Preziosa Basket, and more. 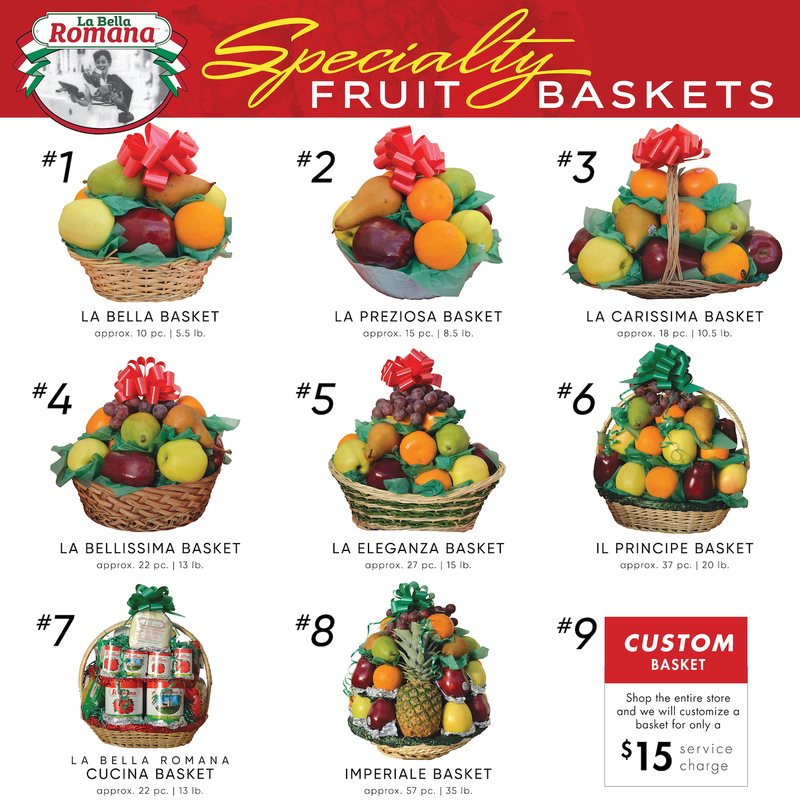 These are different sized fruit baskets– ranging from 10 pieces to 57 pieces. 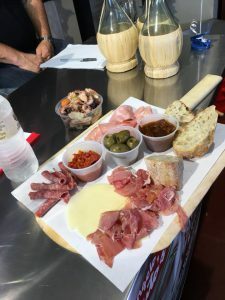 We also have a La Bella Romana Cucina Basket that contains various La Bella Romana products and is perfect for the cook in your life. If you are looking for something different, we do custom baskets! You can shop the store and customize the gift basket to make it perfect for the person receiving it. Some of the custom ones we have created in the past have been chocolate, candy, and more! No matter who you are giving a gift to, we can help you! The littlest thing can go a long way and can demonstrate how much you care. We want to help you show your loved ones you care! The holiday season is a time to reflect on the blessings you have and is a time to give back to the community. At Caputo’s, we take great pride in giving back. We have many programs set up that help us and our customers give back to those in need! One of the foundations we support is called Coats for Kids. Coats for Kids is a foundation dedicated ensuring “that every child who needs a winter coat receives a new one.” Living in the Midwest, we all know the importance of a good coat come winter time. We are faced with tough winters and extreme weather. Coats for Kids allows for people to donate coats to this charity. The coats will then be distributed to families in need. 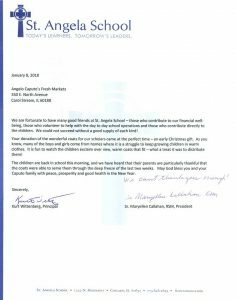 We partner with the Knight of Columbus of the Roselle district for this impactful collection. 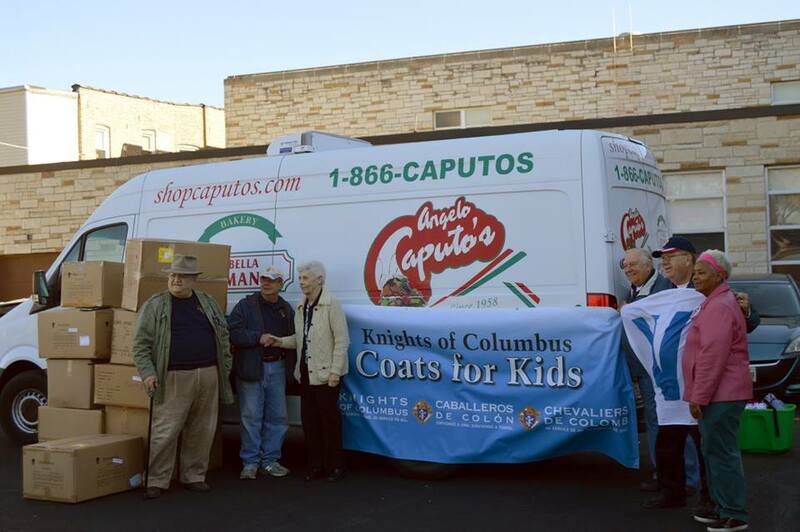 We will collect the coats and distribute them to the Knights of Columbus who will give them out to the families in need. A donation to this cause supports the basic needs of people who have scarce resources. We have been able to collect over 3,000 coats this year thanks to the generosity of our loyal customers! We also offer donation bags. 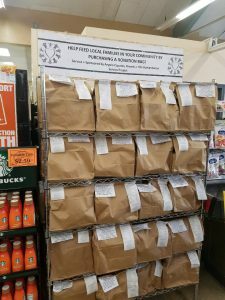 The donation bags are located near the cash registers at each store. The bags contain various types of foods. 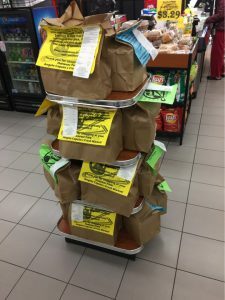 Each bag has a list of the foods in the bag. You can pick a bag and purchase it. The purchased bags will be collected by food banks, such as the Northern Illinois Food Bank, and handed out to those in need. 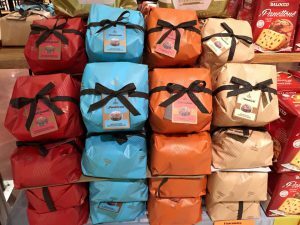 There are different sized and priced bags available. 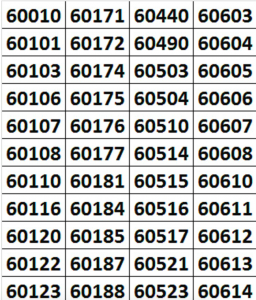 So far this year, we have been able to provide over 9,000 meals to those in need thanks to your help! Another initiative we take year round is donating produce to the food banks. 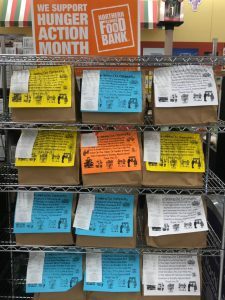 Each store partners with a local food bank. These food banks accept our imperfect produce and goods every week. They use these foods to feed the local community members struggling to feed themselves and their families. Helping the community and giving back to those in need is a big part of who we are at Caputo’s. 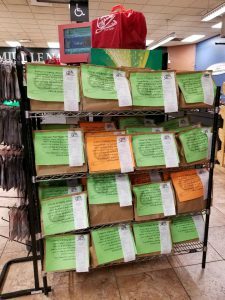 We are so thankful for our generous customers who support these local missions with us! From our family to yours, have a blessed holiday season!